An adventure canoeist who was sponsored by Ocean Signal for an epic 2000-mile journey across Alaska has launched a new book about the mission. Writer Adam Weymouth paddled the treacherous Yukon river from Eagle to Emmonak in 2016 to investigate how the decline in King Salmon numbers is impacting the ecosystem, the fishing industry and the natives. 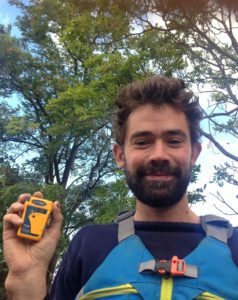 Supported by communication and safety at sea specialist Ocean Signal, the 34-year-old carried rescueME PLB1 personal locator beacons for himself and his companions. The devices ensured immediate access to vital 406 MHz technology which could communicate his location from the most remote regions to rescue authorities in an emergency. Now, the book Kings of the Yukon captures the epic four-month voyage as Weymouth tackled storms, waves and the threat of bears. Ocean Signal products are trusted by high-profile sailors, rowers, surfers and powerboat racing team across the world and include 406 MHz beacons, AIS devices and electronic distress flares. Suitable for use on land or at sea, Ocean Signal’s rescueME PLB1 is the world’s smallest personal locator beacon and is specifically designed to be small and light enough to carry or attach to clothing for instant access to emergency services at the press of a button. Kings of the Yukon can be pre-ordered at http://www.adamweymouth.com/kingsoftheyukon/.